I went home to visit my parents recently and I was reminded of an image that has been with my since as far back as I can remember. 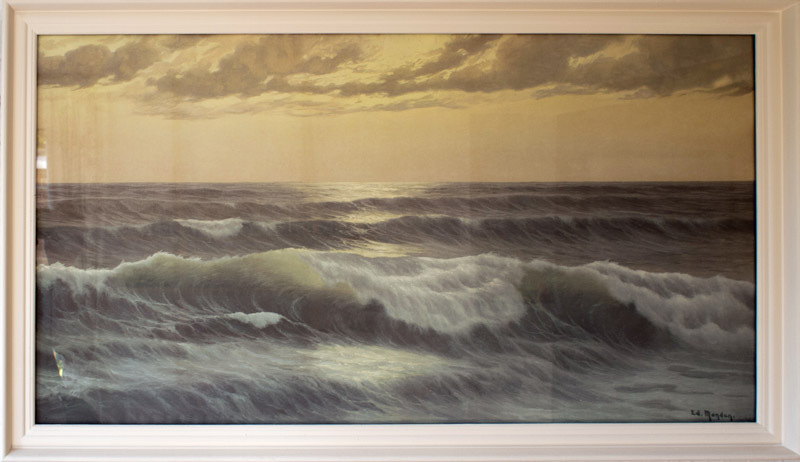 It’s a print of a painting called ‘Song of the Surf’ by Ed Mandon. I expect it was a popular print in its day, that being the early 1960’s. I remember often looking into this picture of the sea. Not the pretty turquoise blue of Cornwall or Greece, or the palm tree lined sun bleached cove, the peaceful relaxing sunset or the family snapshot of children paddling in the shallows; no this was Mandon’s deep green sea, wild and free, the waves endlessly crashing in my mind, a vast living breathing entity. The sky, a cold yellow with the threat of rain. It’s a picture that has influenced my subconsciously for a long time. I remember once on Marconi Beach, Cape Cod, I ran down the beach towards the sea and the waves as the holidaymakers ran in the opposite direction, fleeing (as if for their lives) as huge thunderclouds gathered over the ocean. I’m a lot closer to that deep green wild enticing sea now living in North Devon. And getting closer to it in my own work. ‘Song of the Sea’, it certainly calls you; maybe that’s the point, maybe it’s song and call is at its loudest when the sea is in its foulest mood and perhaps that is why the coast here is the ‘Graveyard of the Atlantic’.